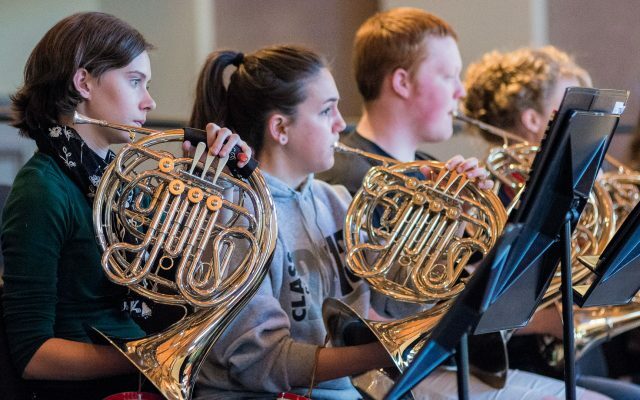 Over 25 percent of students campus-wide participate in one or more of the music ensembles. While orchestra and choir are the two largest ensembles, students can also receive credit for chamber choir, big band, pep band, chamber ensembles, and many more. Opera workshops allow students studying advanced private voice to direct and perform both small opera scenes and complete staged productions. Every four years, the orchestra and choir team up to perform Handel’s Messiah. The music department collaborates with the theatre department and dance department for a variety of projects including musicals. 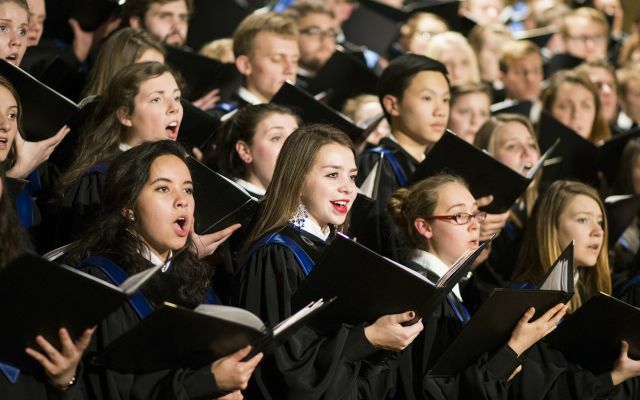 The Hillsdale College Choir is a mixed choral ensemble of more than a hundred voices with membership open to all Hillsdale College students. The choir performs and records a broad range of repertoire from the different historical periods of Western civilization. From single a cappella settings of traditional works to major oratorios with orchestra, students get a chance to explore a wide range of musical styles while learning to develop their voice and musical skills. 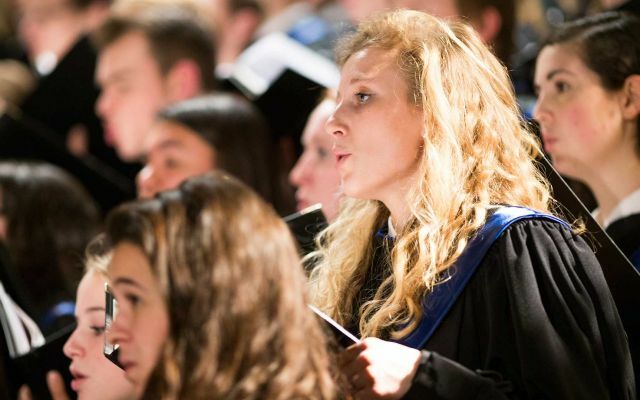 The Hillsdale College Chamber Choir is selected by audition from the membership of the larger College Choir. This select ensemble performs at many college functions on and off campus and has established a tradition of excellence while exploring the vast repertoire of chamber vocal music. Professor Emeritus Edwyn Hames founded the Hillsdale College Symphony Orchestra in 1951. 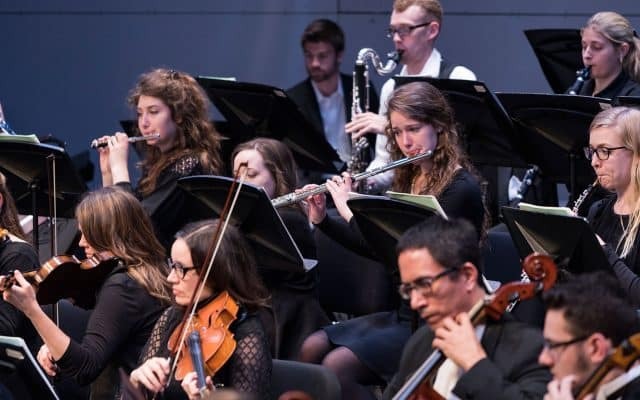 Today the Orchestra is a full symphony orchestra comprised of strings, woodwinds, brass, and percussion with membership open to Hillsdale College students and members of the surrounding Hillsdale community by audition or recommendation of studio professors. Music Department faculty serve as members of the orchestra where they coach their respective sections. The orchestra performs a broad range of standard repertoire from the different Western stylistic periods including modern works, often featuring faculty, student, and guest soloists. 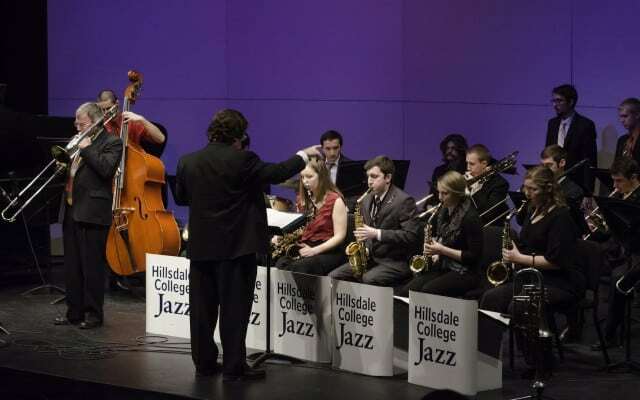 The Hillsdale College Big Band is a twenty-plus piece jazz ensemble modeled after the standard instrumentation of the popular groups of the swing era. The ensemble performs standard charts as well as new compositions. The group maintains an active performing schedule both on and off campus culminating with a main stage performance featuring a guest artist each spring. 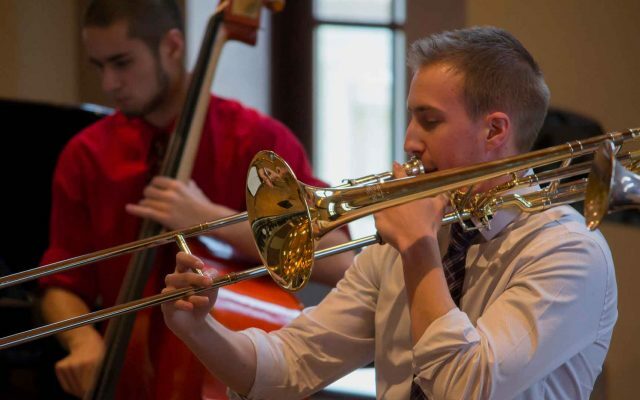 Students interested in playing jazz are assigned to small jazz combos of various instrumentations with other students who share similar experience and technical levels. In the combos, focus is placed on learning to improvise through understanding jazz scales and chord changes. The combos perform at different college and community functions both on and off campus. Most instruments—including voice—are welcomed to participate in the jazz combos. Students who choose to participate in various chamber ensembles receive faculty coaching and are given many different venues to perform. Students may either participate in established ensembles or create standard or unique ensembles with other interested students. Current established ensembles include: string quartets, piano trios, woodwind quintet, brass quintets, flute ensemble, guitar ensemble, saxophone quartet, trombone choir, tuba/euphonium ensemble, and others. 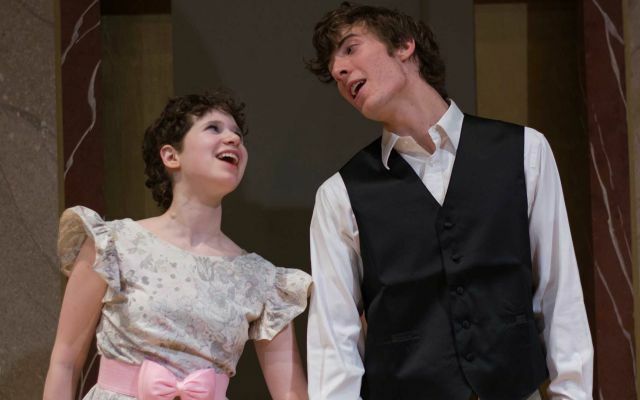 Students enrolled in private voice instruction may participate in the Opera Workshop projects. Opera Workshop varies from performing various individual scenes from the opera and Broadway repertoire to performing complete operas. Staging, lighting, and costumes are kept at a basic level with focus placed on singing and acting. 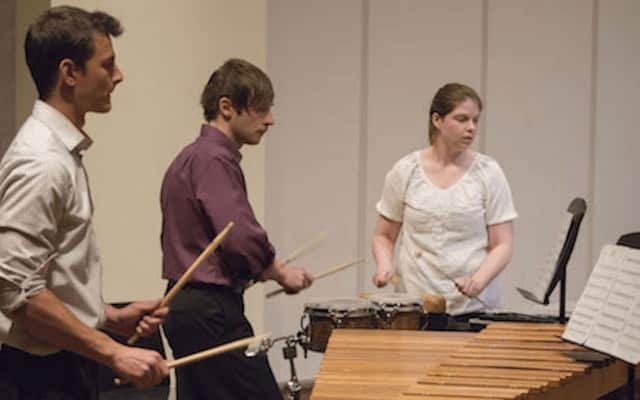 The Hillsdale Percussion Ensemble specializes in the performance of modern classical percussion chamber music. Founded in 2003, the ensemble consists of percussion majors and minors, as well as enthusiasts who are involved in percussion studies. 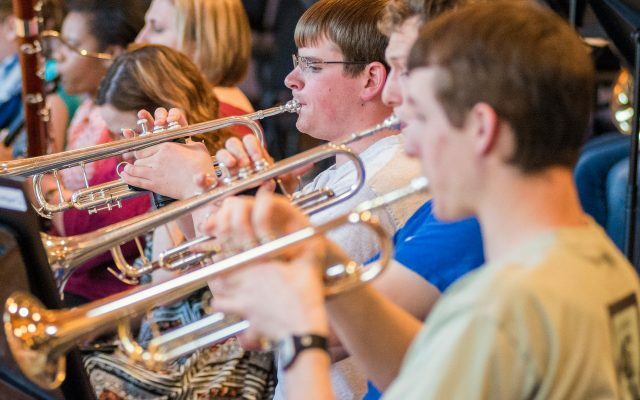 The Hillsdale Community Wind Symphony is open for participation to members of the surrounding Hillsdale community and Hillsdale College students, faculty, and staff. The ensemble rehearses on campus in the Howard Music Building and can being taken for credit by Hillsdale College students. The group performs standard band and wind ensemble repertoire with full instrumentation. 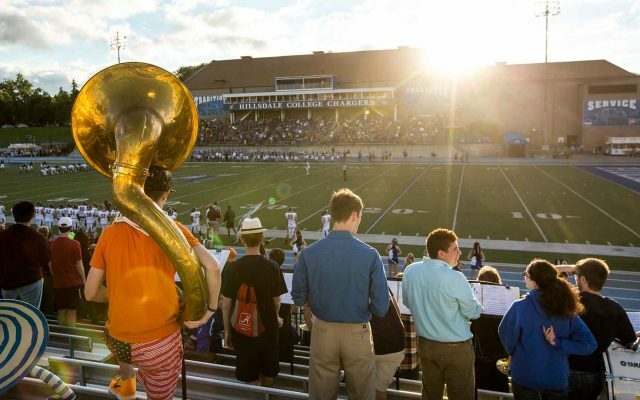 Performing at Hillsdale College football and basketball games both home and away, the Charger Pep Band is open to any student who chooses to participate. Rehearsals are faculty-led, while appointed student leaders from the group get the experience of directing at games.